With the Apple Time Capsule, you’ll be able to give your computer automatic, constant protection over a blazing-fast, secure wireless connection. Time Capsule includes a wireless hard drive designed to work with Time Machine in Mac OS X Leopard or later. Just set Time Capsule as the designated backup drive for Time Machine, and that’s it. One-click continuous backup for your Mac using Time Machine. This 4th generation version of Time Capsule features a 2 TB hard drive. It also operates in the 2.4 GHz and 5 GHz bands simultaneously to ensure top performance for all your devices, and it provides a Guest Networking option for easy Internet sharing. You’ll be able to share your entire wireless network with up to 50 users at the same time as well as turn a USB hard drive into a shared drive that’s accessible wirelessly on your network and now over the Internet. Time Capsule is your one place for backing up everything. Its massive 2 TB server-grade hard drive gives you all the capacity and safety you need. So whether you have 250 songs or 250,000 songs to back up, you won’t run out of room. Depending on how much data you have, your initial backup with Time Capsule could take overnight or longer. After it completes, only changed files are backed up–automatically, wirelessly, and in the background–you’ll never have to worry about backing up again. And new technologies in Time Capsule and refinements to Time Machine make backing up to Time Capsule even faster than before. 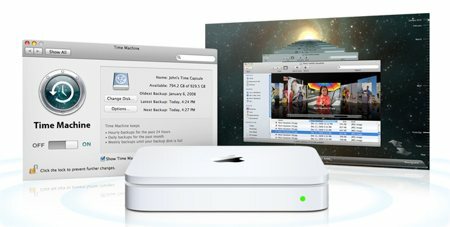 If you have multiple Mac computers in your house, Time Capsule can back up and store files for each Mac running Mac OS X Leopard or later on your wireless network–no need to attach an external drive to each Mac every time you want to back up. Time Capsule with Time Machine in Mac OS X Leopard or later is the ideal backup solution. But that doesn’t mean Mac OS X Tiger, Windows XP, and Windows Vista users can’t enjoy the benefits of Time Capsule, too. Because Time Capsule mounts as a wireless hard drive, Tiger and Windows users simply access Time Capsule directly from the wireless network for exchanging and storing files quickly and easily. The Apple Time Capsule is based on the Wireless-N (IEEE 802.11n) specification and it uses multiple-input multiple-output (MIMO) to transmit multiple data streams simultaneously–resulting in data transfer speeds up to five times those of 802.11g wireless networks while also providing up to twice the range. It’s compatible with Mac computers, PCs, and wireless devices such as iPad, iPhone, and iPod touch that use 802.11a, 802.11b, or 802.11g technologies. Additionally, some Wi-Fi devices use the 2.4 GHz wireless band (such as the iPhone, iPod touch, and other devices using 802.11b/g). And other devices can use both the 2.4 GHz spectrum as well as the higher speed 5 GHz spectrum–such as 802.11n-based Mac computers and Apple TV. Time Capsule operates simultaneously on both bands, without you having to choose one spectrum over the other–enabling your Wi-Fi devices to receive optimal performance in speed and range. Plus, devices that can connect to Time Capsule on either band will automatically use the best available band. Share a printer with your networked Macs and PCs. Allow guests to use your Internet connection without sharing your password or giving them access to the rest of your network. Simply enable the guest networking feature using the AirPort Utility application and create a separate Wi-Fi network just for your friends. You can set up this guest network with a different password or with none at all. Your primary network–including your printer, attached drives, or other devices–remains secure. 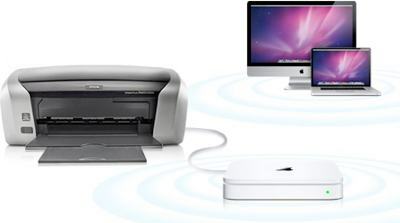 With its wireless printing capabilities, you can plug a printer into Time Capsule, add it to the printer list on your Mac or PC, and start printing–all without a cable tethered to a computer. Time Capsule uses the Mac- and PC-compatible Bonjour networking technology to let everyone on the network take advantage of one centrally available printer. – Includes a free download of JetFlash Elite.